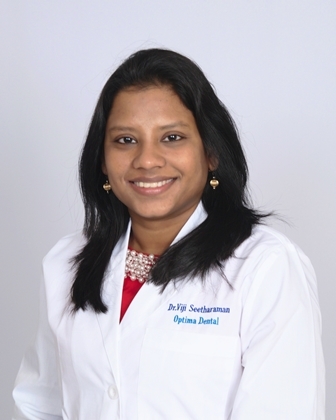 Dr. Viji Seetharaman is a top-rated dentist providing compassionate, skilled dental care for adults and children in and around Bristol, Pennsylvania. At Optima Dental, Dr. Seetharaman offers advanced treatment solutions based on the patient’s unique needs, including dental cleanings and checkups, root canal therapy, tooth extraction procedures, dentures, veneers, teeth whitening treatments, and the Invisalign® orthodontic system, as well as comprehensive pediatric dentistry care. The practice features state-of-the-art technology which enables Dr. Seetharaman to provide truly customized, patient-centered care for the whole family. Dr. Seetharaman earned her Doctor of Dental Surgery (DDS) degree from New York University College of Dentistry, practicing at several dental offices before opening her own practice in Bristol. Dedicated to providing her patients with the most innovative treatment options, Dr. Seetharaman participates in continuing education opportunities to hone her skills and enhance her expertise. At Optima Dental, she offers every patient the appropriate care options based on a deep understanding of the patient’s needs and treatment objectives. Her commitment to patient health and comfort and her calm demeanor have made her a favorite among patients of all ages, including patients with dental anxiety. When not caring for patients, Dr. Seetharaman enjoys spending time with her husband and children. she welcomes new patients. We accepts most dental insurance plans.